Grafenwoehr, Germany - Staff. Sgt. Aaron Madasz was presented the first Staff Sgt. 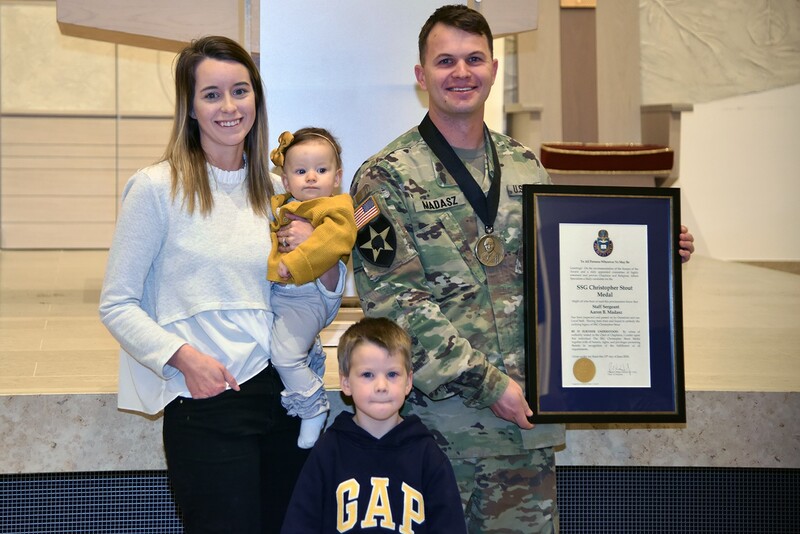 Christopher Stout Medal signed by the chief of chaplains, Nov. 7, 2018. 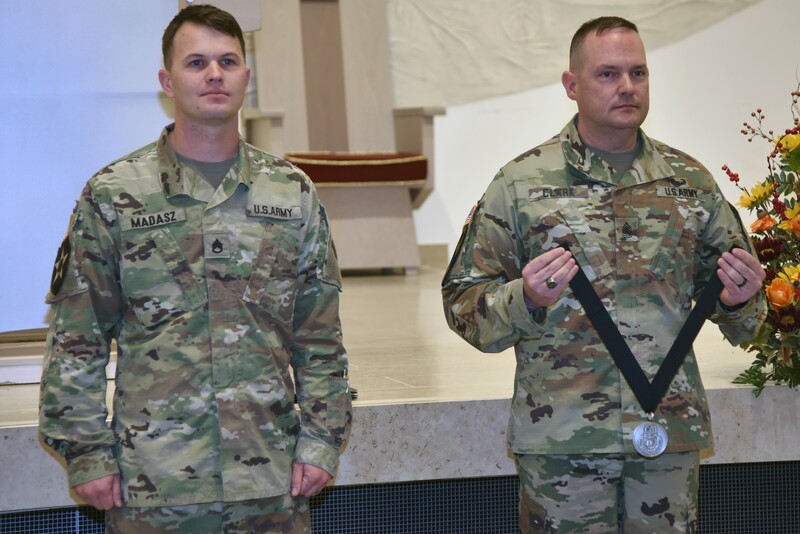 Madasz is a religious affairs specialist for 2nd Cavalry Regiment in Vilseck, Germany, and was nominated for the Stout Medal, one of four Chaplain Corps Regimental awards given out by at the Department of the Army-level. Madasz is one of three recipients across the career field who received the award in its inaugural year. Stout was a religious affairs specialist, then called a chaplain's assistant, who died 2010 in Afghanistan. According to the U.S. Army Chaplain Corps, he was the first chaplain assistant to be killed in action since the Vietnam War. "For me this is a little overwhelming," said Madasz. "I hope I have the same character that he had: a man of faith, a great father and a great husband. I hope that I resemble that as well." Sgt. Maj. David Clark, the U.S. Army Europe chief of religious affairs sergeant major, explained that the new award is for religious affairs specialists who make an impact, and do it extremely well. "It's limitless what the actual circumstances have to be but what's the same is that the performance is above and beyond what would normally be expected," he said. 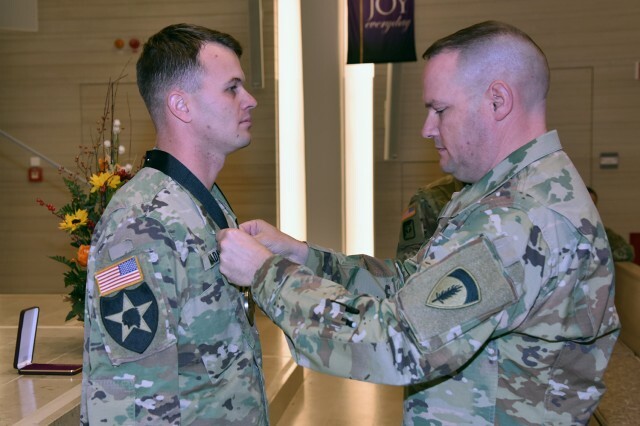 Madasz was a sergeant when he came into the 2CR position that is slotted for a staff sergeant. 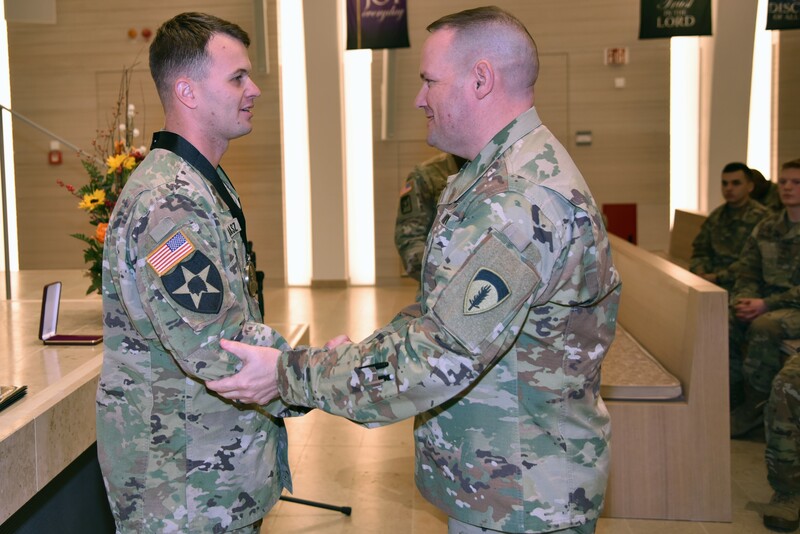 As Clark explained, 2CR is one of the more difficult staff sergeant positions in Europe, due to the operational tempo of the unit and normally, a sergeant doesn't have the skill set to rally the troops. "He went in that position and not only performed well, but performed better than previous staff sergeants had performed," Clark added. "This is an example of recognizing people for exceeding the standard and doing well in their career field." 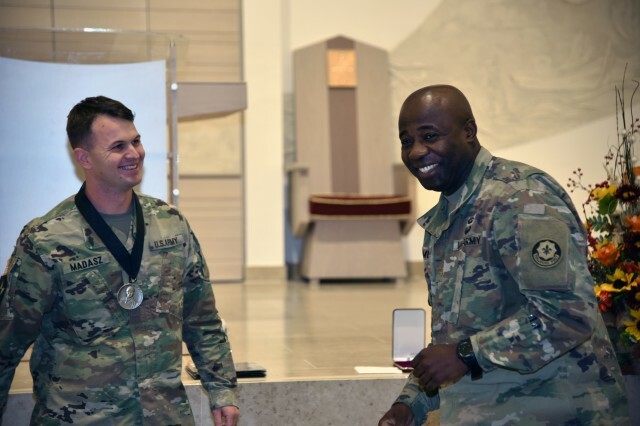 Maj. David Mvondo, 2CR chaplain, wrote the original recommendation for Madasz, citing his professionalism and competence; the service, character and values he brought to the team; and his impact, influence and accomplishments in the last 2.5 years he's been with 2CR. "This is truly a very joyful event as we present this award to him," he said. "He's the religious affairs noncommissioned officer that you want have." 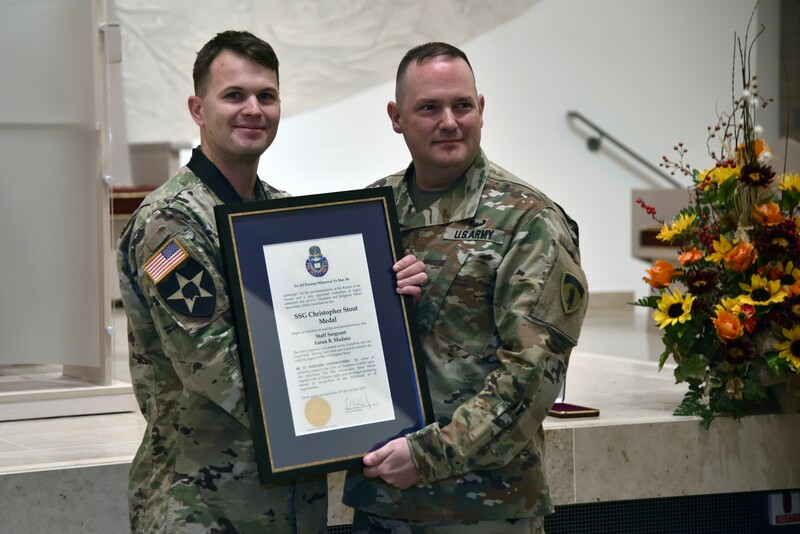 Madasz is soon departing Germany for the U.S. Army Chaplain Center and School in Fort Jackson, South Carolina, but takes the recent honor as an encouragement to continue to help groom Soldiers and NCO be who they're called to be.